Present-day Elfreth's Alley is the product of cycles of urban renewal, decay and on-going preservation efforts. Nestled between Second Street and the Delaware River, thirty-two Federal and Georgian residences stand as reminders of the early days of Philadelphia. Designated a National Historic Landmark October 15th, 1966. Elfreth's Alley was not included in original plans for Philadelphia. As Philadelphia became a bustling city, artisans and merchants purchased or rented property close to the ports where goods and materials arrived. This led to overcrowding, and landowners recognized that tradesmen needed alternate routes to the river. 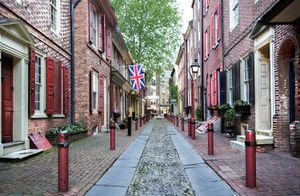 Landowners Arthur Wells and John Gilbert combined their properties between Front and Second Streets to open Elfreth's Alley, named after silversmith Jeremiah Elfreth, as a cart path in 1706. Today, Elfreth's Alley is an "exceptional example of early American structures built between 1720 and 1830" according to the historic marker designated in 2016. The alley is in stark contrast with nearby historic sites, by celebrating the working class of America who helped build this country through sweat and commerce. The alley is still a thriving residential community which is home to artists and artisans, educators and entrepreneurs, and everything in-between. One of the 32 historic homes on Elfreth's Alley just went on the market, Philly Voice, December 11, 2018.